Resort Style retreat in the exclusive community of “Silver Trees”, this highly upgraded, half acre, 4 bedroom, 2.5 bath single story “dream home” is nestled high above the city lights on a private cul-de-sac with spectacular 360 views of mountains & lush canyons. A double door entry leads to a dramatic step-down formal living room with soaring ceilings, indoor atrium and an over-size great room complete with wet bar, custom cabinets and a custom built brick fireplace. A wall of glass exits to the stunning brick patio featuring a new vaulted-ceiling gazebo, outdoor fireplace and an elegant full-size pool and over-size spa. The open, inviting kitchen includes a center island, new stainless appliances and sink, granite counter tops, oversized walk in pantry & eating area. Recessed lighting and granite counters throughout, a large formal dining, remodeled laundry room, completely renovated bathrooms with custom vanities, granite counters, designer tile and walk-in showers. A remodeled 3 car garage with large storage area. 4 spacious bedrooms (one used as an office) elegant crown molding, large cedar lined closets, direct access to the patio from the master retreat. High-end double pane windows and beautiful plantation shutters throughout. Custom skylights & kitchen windows. The landscaping is truly stunning & lush. New roofing with staggered tile placement to compliment its appeal. 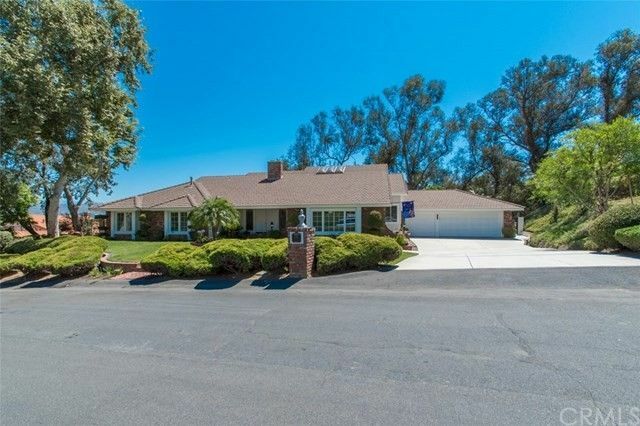 The area is 2nd to none, award winning schools, and very close access to the 91 and 241 fwy's.